Resembles Redshank, but often stands more upright with longer neck, smaller head and proportionally short slightly drooping bill; often looks hump-backed and pot-bellied; female noticeably smaller than male (and smaller than Redshank). Flight lazy on rather broad wings deeply depressed on downstroke, sometimes interrupted with glides, especially before landing; flight pattern shows narrow, dull wing-bar and characteristic oval white patches at tail-base, often forming a ‘V’. Plumage and bare parts vary in adult male, less in adult female and least in juvenile. 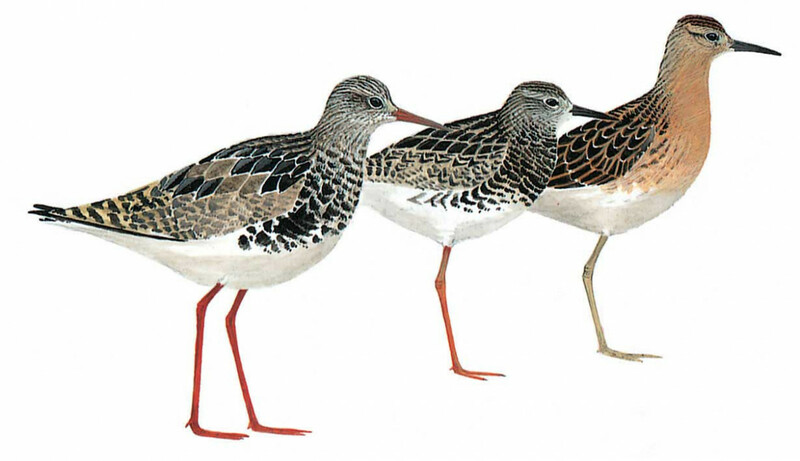 Upperparts, breast and flanks in adult show a mixture of black, brown, chestnut, ochre and white, heavily barred or blotched (male shows large ruffs and ear tufts in spring). Plumage greyer in winter; lores always pale, and face is often whitish in non-breeding season; rear belly and undertail are always white; few males (sometimes females too) show white on head, neck and breast; bill is mostly blackish brown, but can be yellow or pinkish, tipped dark in some males; legs of both sexes vary from orange-red to greenish grey. In juvenile, upperparts look scaly: blackish brown, distinctly fringed buff, and head, neck and breast yellowish brown, tinged orange, legs are yellowish brown or greenish. Often gregarious.